This is a Brussels sprouts dish sure to please even the most picky eaters at the table. 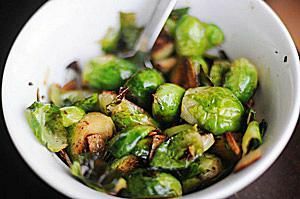 This browned garlic Brussels sprouts recipe caramelizes garlic and Brussels sprouts to sweet, golden perfection. A sprinkle of lemon juice and seasonings provide a healthy way to make the flavors pop in this quick and easy side dish. Melt the butter in a large skillet set over medium heat and sauté the garlic until it just starts to turn brown. Transfer the browned garlic to a bowl and set it aside. Arrange the Brussels sprouts, cut side down, in the hot skillet and allow them to cook without stirring for 10 to 15 minutes. The bottoms will be lightly caramelized when they are done. Toss the browned Brussels sprouts with the reserved garlic, lemon juice, salt, and paprika. This browned garlic Brussels sprouts recipe makes 4 to 6 servings.